This beautiful Cley Summerhouse was installed in our customer's garden in Witney, Oxfordshire and is part of our wider collection of timber garden summerhouses. The exterior was finished in our unique Sandstone Valtti paint and is perfectly complemented by the terracotta slate-effect roofing tiles. All of our buildings are fully customisable to your exact requirements and benefit from delivery and installation by our expert team as part of our end to end service. 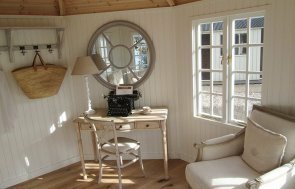 We hand-craft all our garden buildings at our factory HQ in Norfolk using only the finest Scandinavian timber from our partner mill in North Sweden. As the buildings are built by hand, we offer a completely bespoke options where you can take one of our buildings as the base and personalise it to your requirements - simply tell us what you'd like and we'll build it! If you’re in the area why not visit us at our Oxfordshire show centre in Burford, to experience the luxury service we provide first-hand. We have over 25 different sizes and styles of garden buildings on display for you to view at your leisure. Should you have any questions or concerns, a member of our friendly team will be on hand to provide guidance where needed. 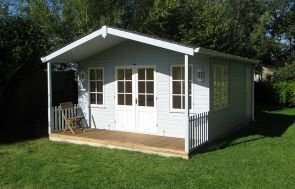 Alternatively, if you would prefer to continue browsing online, you can see the whole range of summerhouses by clicking the link below.